Kagyu Samye Ling Monastery near Langholm in Dumfries and Galloway is the largest Buddhist establishment in Western Europe. Source. On this day in 1959 the government of the People's Republic of China abolished the Tibetan government of the Dalai Lama. Since 2009 this anniversary has been an official holiday called Serfs Emancipation Day. Source. This manuscript leaf comes from the Tibetan Collection of the US Library of Congress, and contains a passage of music notated in an evocative script that certainty looks like music even if you can't construe the sounds. Tibetan books usually take the form of a stack of long narrow unbound leaves between two wooden boards tied together with a scarf. A musician playing from this would likely need an assistant to turn the pages, but that's not much different from a Western score. Other Tibetan libraries are the Library of Tibetan Works and Archives in Dharamsala, India; the Tibetan Buddhist Resource Center; and the Tibetan Collection at the University of Virginia. 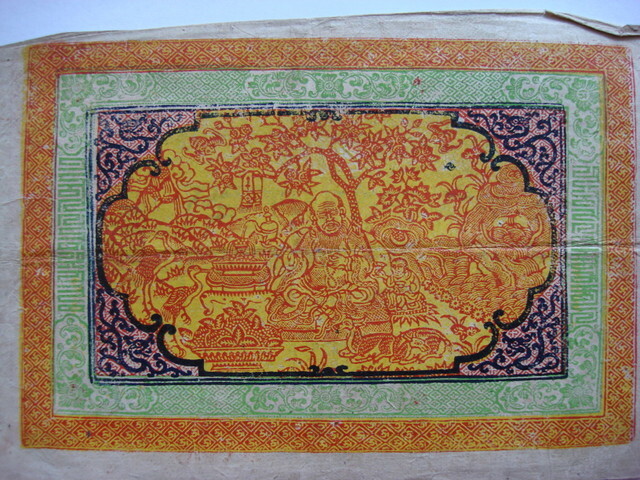 This 100-srang note dating from the 1940s or '50s is a lovely example of Tibetan colour sense and graphic design. It includes a clever security feature, too. The obverse and reserve sides were printed on separate sheets and then mated around a slip of paper containing a motto that can be read by holding the note up to the light. 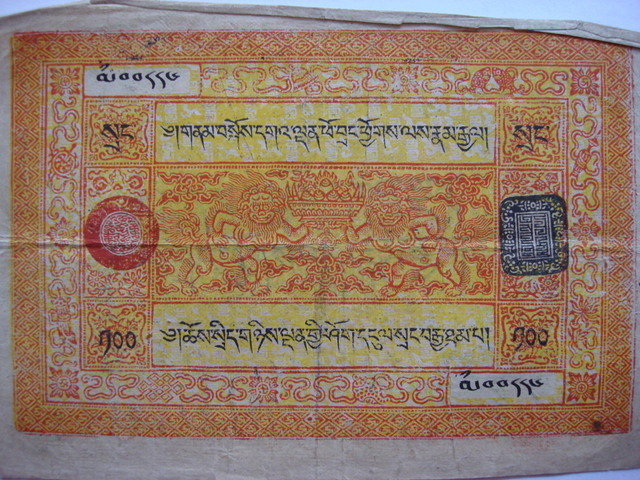 For more on Tibetan money see here and here.